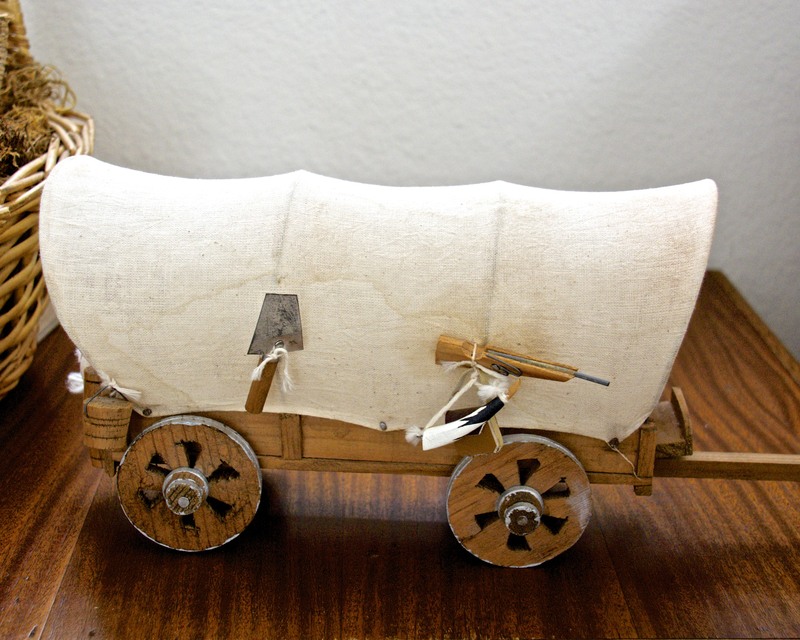 Posted on September 9, 2015	by Lou Murray, Ph.D.
A little covered wagon, handmade in Mexico–this inexpensive E-bay find came with a tiny shovel, rifle, powder horn, bucket, barrel, and plow–everything a pioneer family might need. When I was growing up, I loved hearing my mother and aunt talk about their grandparents, Andrew Thomas and Louisa Caroline Hedrick, and their 1880 trip west in a covered wagon. The Thomas family went to the Red River country between Oklahoma and Texas, and lived with the Indians there for a year in Chickasaw territory. My great-grandmother had a baby there, but was too sick to nurse her baby. An Indian woman fed the baby mashed pumpkins and saved his life. My great-grandparents named their baby after the woman’s husband, Charley Horse. I am not making this up. I am a Slow Food aficionado, and believe in growing my own food, cooking from scratch, and preserving the harvest. I want to pass our food traditions and family history on to my four little grandchildren, so I decided to play “covered wagon days” with them on a couple of visits to our house. Life in the 1880s was a far cry from today’s plugged-in and pre-packaged world. 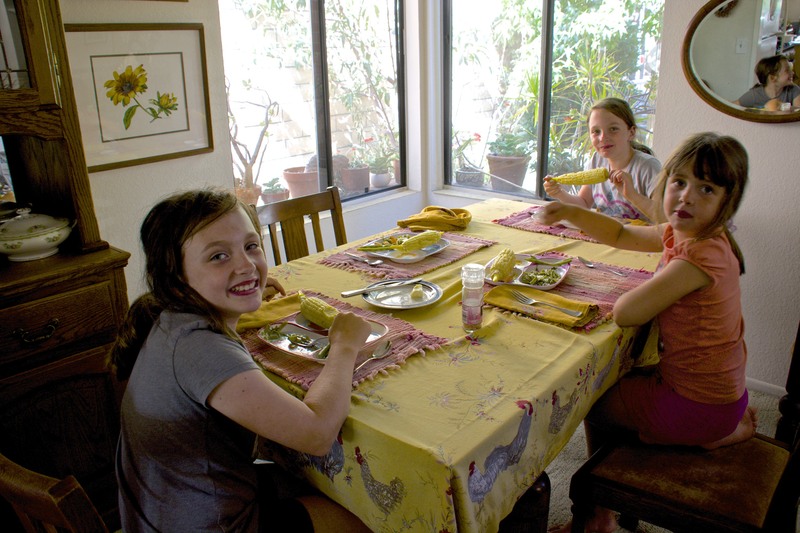 The grandkids love visiting my little urban “farmlet” with fruit trees, vegetable gardens, and even chickens! We play like we are farmers who are living in the late 1800s, going west by wagon train. Allison, left, Megan, middle of the table, and Lauren at the other end of the table. Mike was off in his own boy world, playing with toy cars and trucks. I bought quite a few toy Breyer horses recently, with a barn and corral, so the kids could play farm-homestead-wagon train. The twins are 9 and have read “Little House on the Prairie” in school, so they were really ready for it. Megan is in second grade and loves to harvest produce and cook. Mike will be four next month, and prefers the plugged-in world of iPads, and mechanized toy cars and trucks. He is definitely a motorized modern boy. So I got him a toy horse trailer so he can play modern farmer. My plan was to take pictures of us playing the various roles of homestead life, but the above pic is the only picture of the kids that I got. The rest of the time, it was a four-ring circus, no time for photography. So you will have to use your imagination as I attempt to walk you through our role playing, using photos taken after their visit. Megan harvested all four of my tiny butternut squash, using clippers to cut the stems. Dino-Peep, my hen who thinks she is a dinosaur. 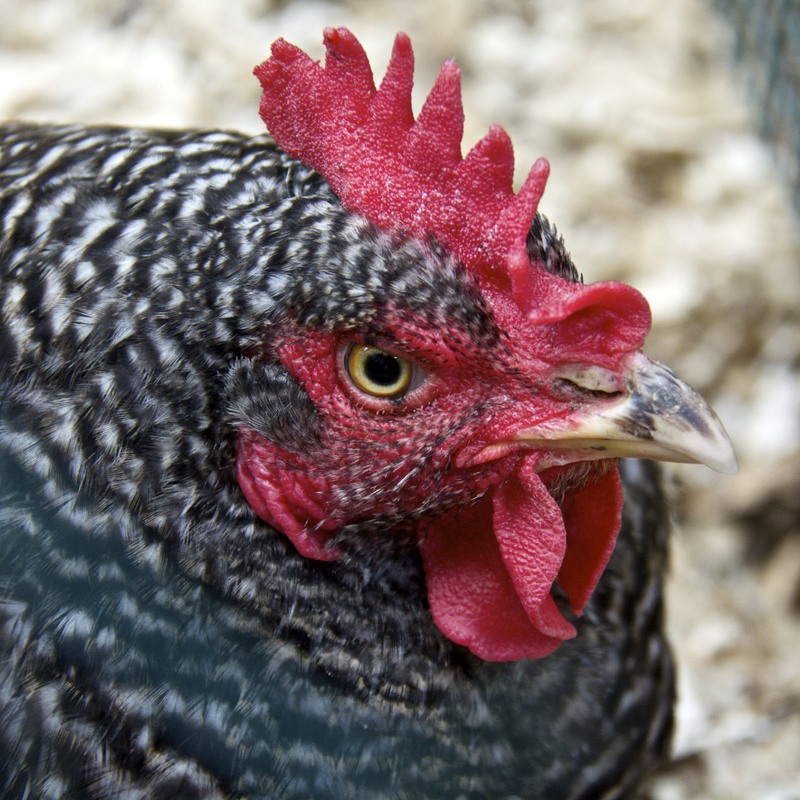 The kids all love feeding our three hens and gathering eggs, and that occupies quite a bit of their time. Megan probably likes harvesting more than the others. 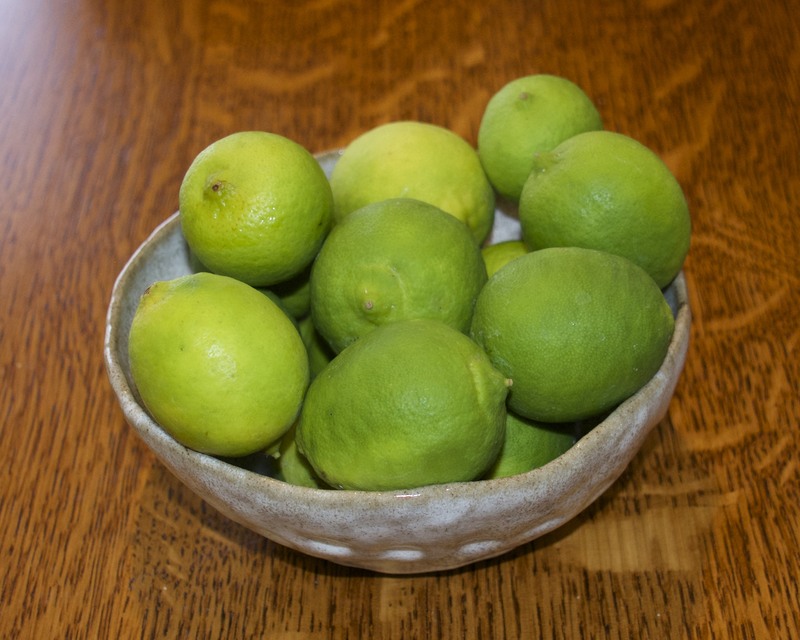 Megan harvested limes and a lemon for herself–not exactly crops one would grow in Indiana. Fall is apple season too. 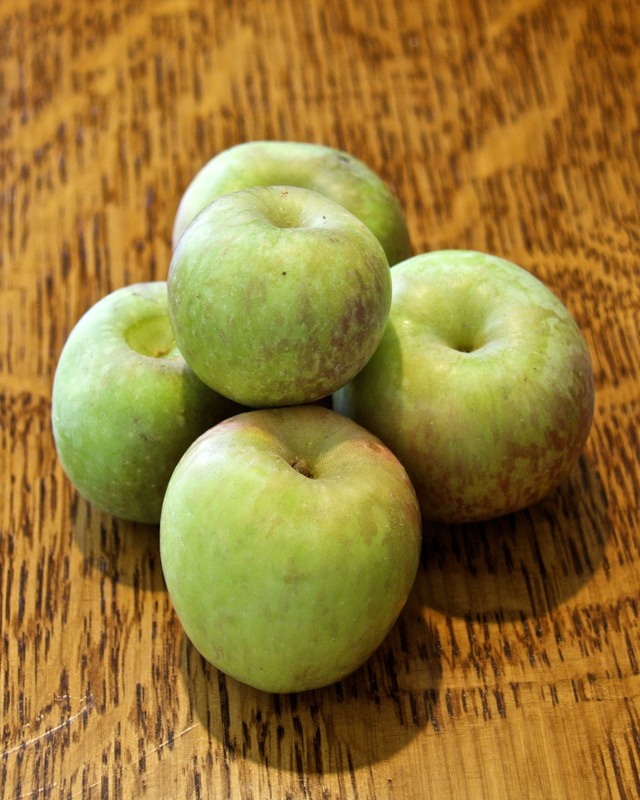 This is the first of our Fuji apple crop. On the trail, we had to build campfires before cooking any meals. I printed out photos of buffalo chips and scattered them around the living room. 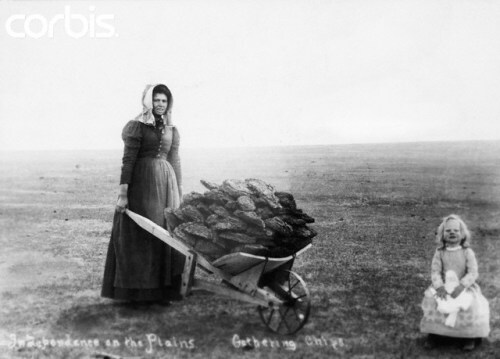 The girls thought it was really gross to pick up dried buffalo poop, but that is what was used for fuel on the treeless prairies. 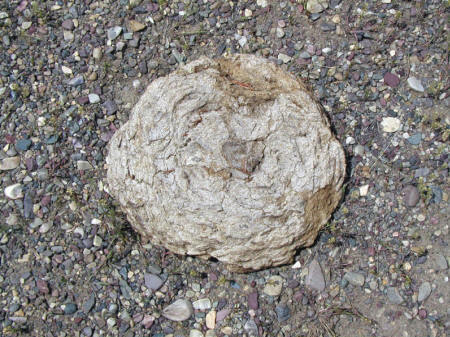 Hey, it was just PICTURES of buffalo poop. A buffalo chip! They are about 8-10 inches across. Don’t pick up the wet ones! I hid a rubber rattlesnake under one of the end tables in the living room, and the kids had to avoid the rattlesnake while picking up the buffalo chips. My husband’s Irish greatgreatgrandmother Mary (Ryan) Kelly was bitten by a rattlesnake while living on the prairie in Iowa in the early 1850s. They lived in their covered wagons until the men got the first crops planted and then built a log cabin. His great-grandmother survived and went on to have many children, including his great-grandmother Nelly (Kelly) Brian. The girls were amazed to learn about some of the differences in lifestyles before electricity and modern grocery stores. 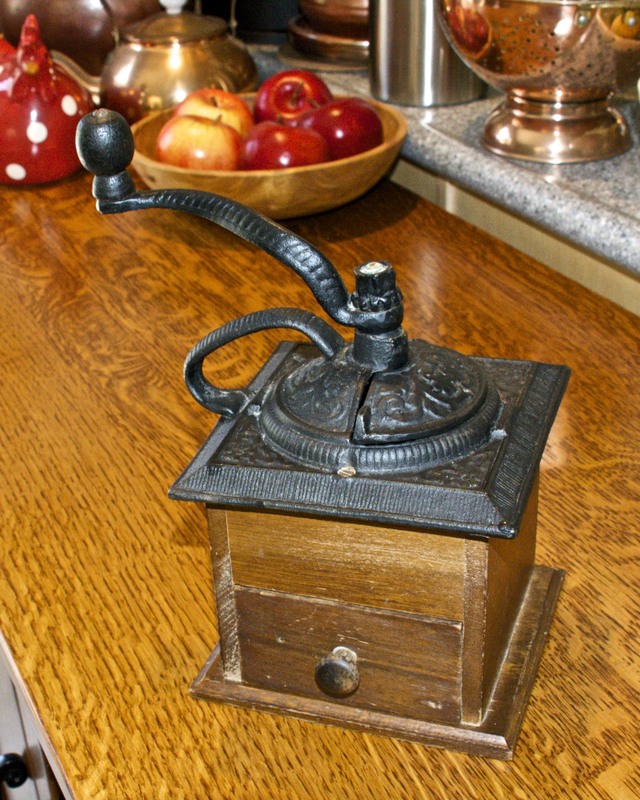 I bought an antique coffee grinder from Goodwill. It actually works, and all four kids enjoyed grinding coffee beans for us. Did you know that baking powder wasn’t invented until about the mid 1800s, and not in common use until later that century? 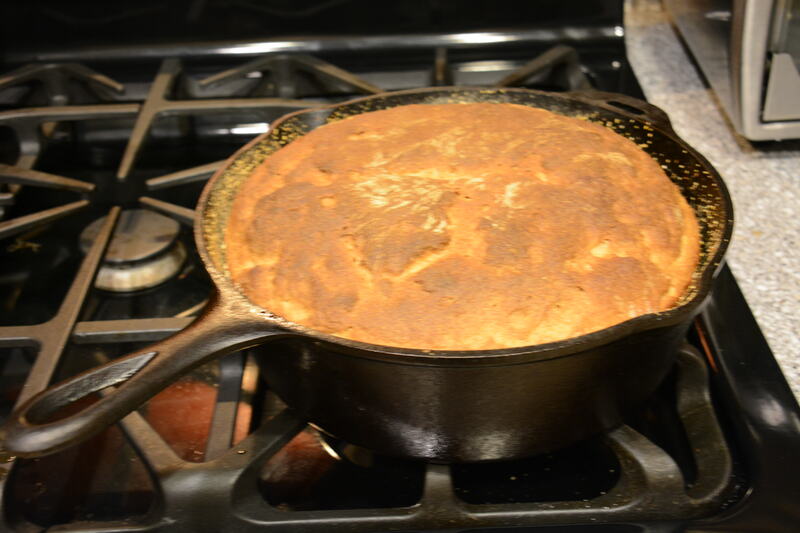 Our ancestors would have used sourdough for biscuits, pancakes and bread, all homemade and cooked over a campfire or in a fireplace before cast iron stoves because available. 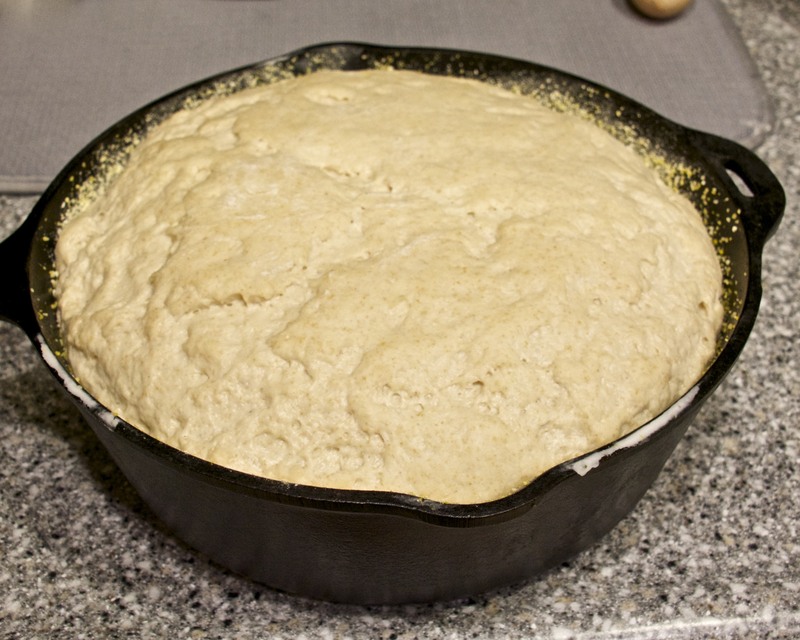 This is a loaf of sourdough bread, ready to cook on my gas BBQ grill. (It is too hot to use the oven in the house.) That was our pretend campfire. 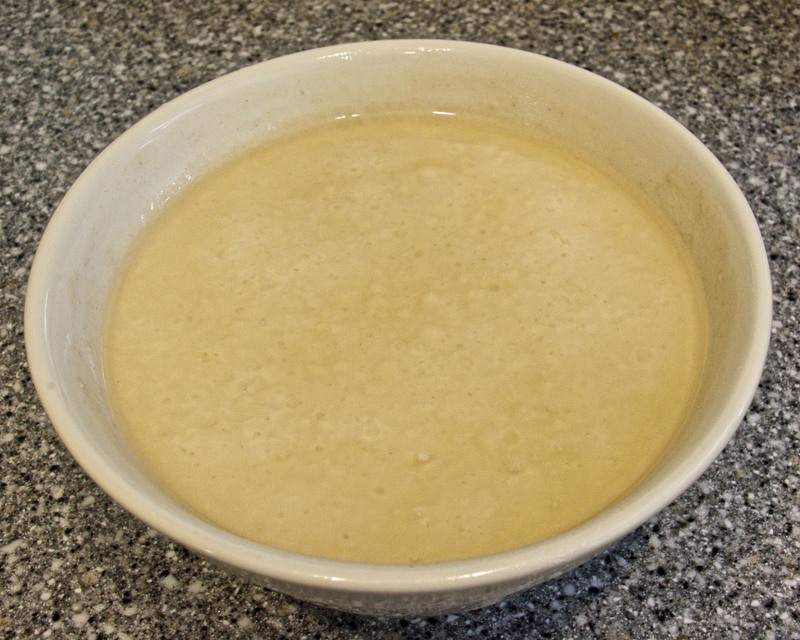 A finished loaf of sourdough bread. I try to use cast iron cookware when we are playing pioneer days. I bought a pint of whipping cream and we made butter. First we pretended to milk our cow. Then I put the cream into a 1 qt glass jar and we all took turns shaking the jar. (I don’t have a butter churn, OK?) It was pretty amazing. First, it became whipped cream, and we all had a sample. After about 12 minutes of shaking, the whipped cream changed. Butter globules separated from the whey, aka buttermilk. I scooped the butter out, added some salt, and we all had fresh butter on crackers. It was delicious, and couldn’t have been fresher. 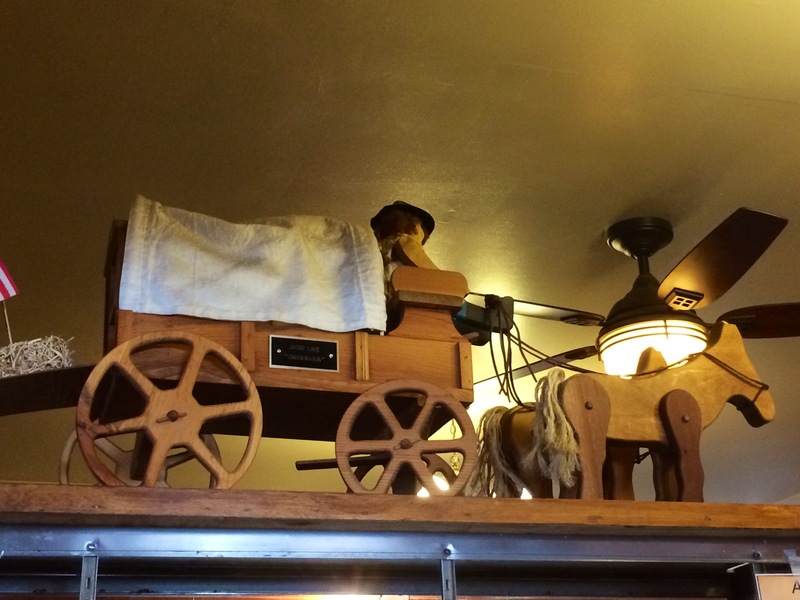 Even toys were different in pioneer times. My grandmother had a china head doll from her childhood in the late 1800s. 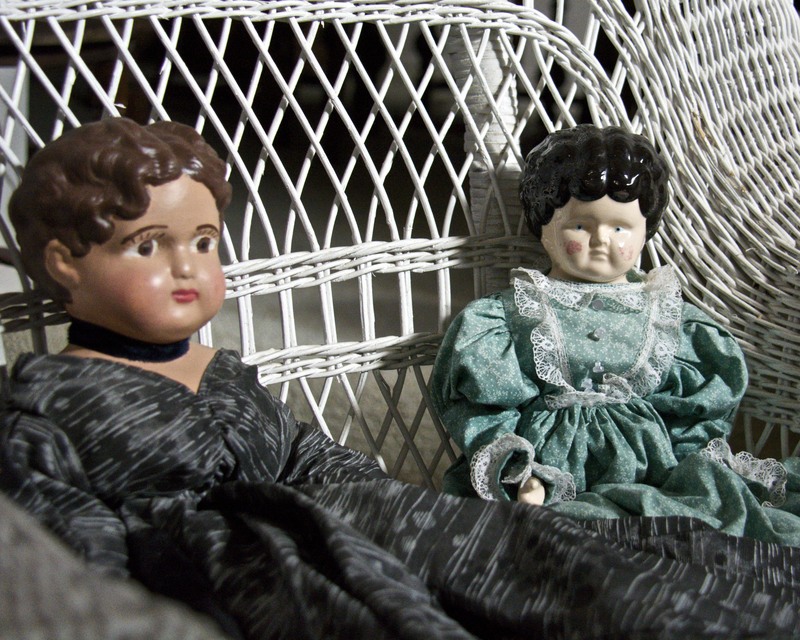 These are reproductions of a bisque head doll (left) and china head doll (right) that I bought at Goodwill.com, a great place for finding antiques and reproductions. One of the things that we do is look at some of my things from times past, like family heirlooms that have been handed down. 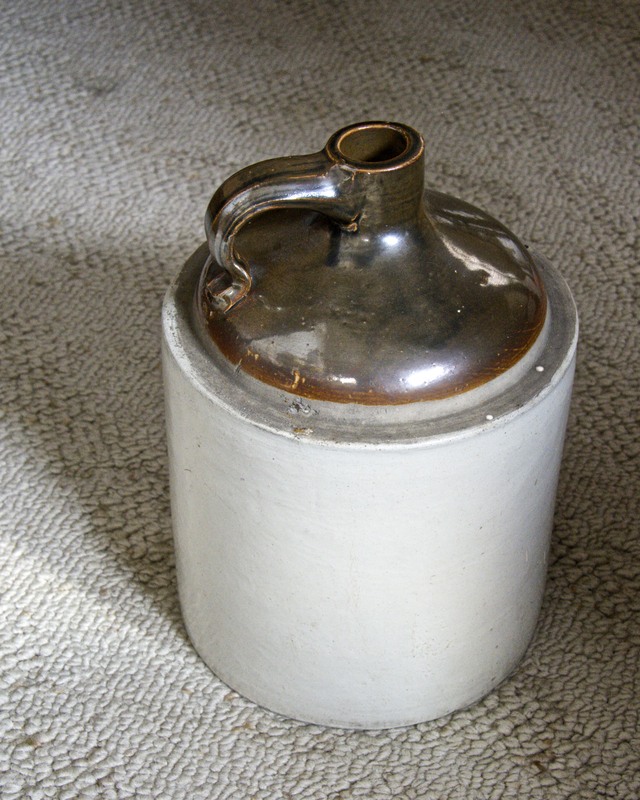 This old whiskey jug belonged to my great-grandmother Mary Ann (Toliver) Williams. This was my great-grandmother Mary Ann Williams’ cream pitcher. Part of our role play is trading with the Indians. The kids’ parents kindly play the role of the Plains Indians. 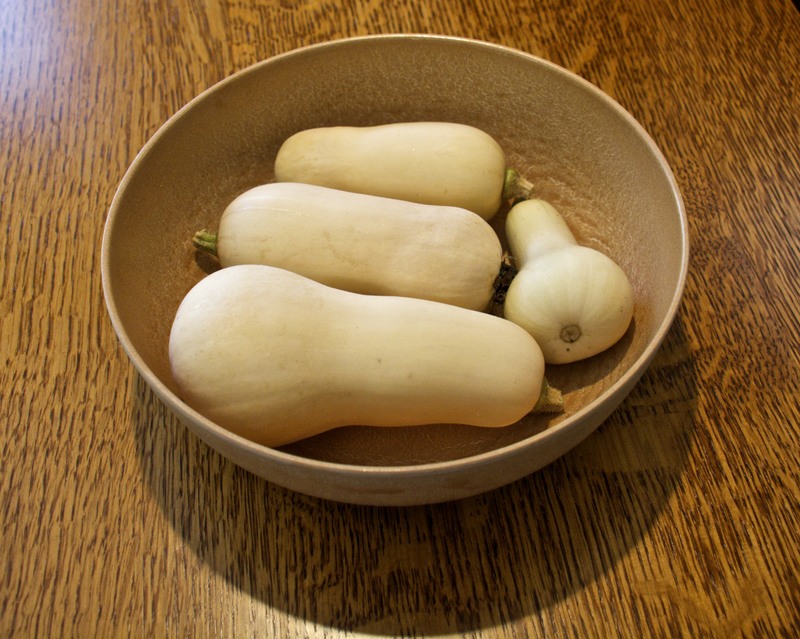 We traded some homemade cookies for some (cans of baked) beans one time, and traded for winter squash another. This helps to teach the beans, corn, and squash are New World foods, along with sunflower seeds, tomatoes, etc. We also trade for jerky, a great food from covered wagon days. 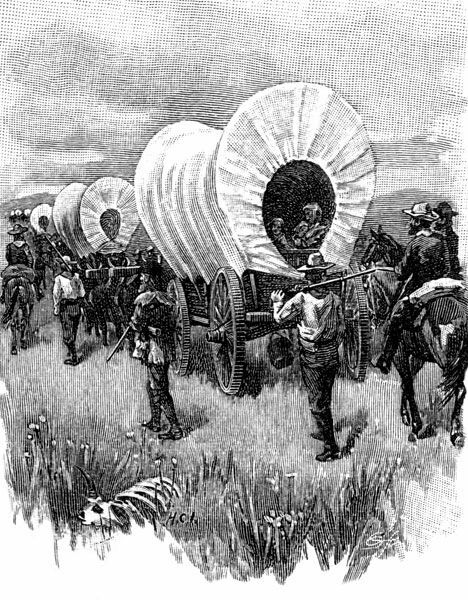 The pioneers would have traded with the Indians, especially my great-grandparents who actually lived with them in Red River country. 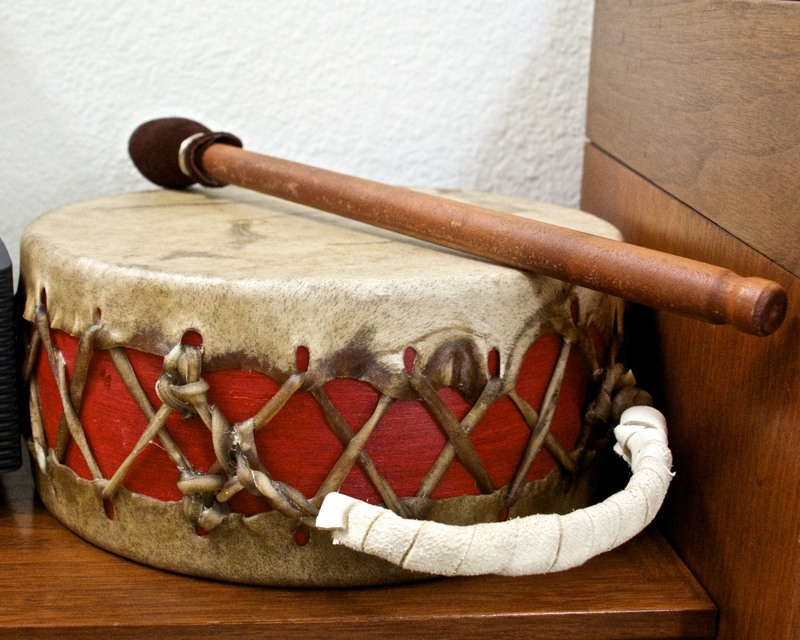 We usually play with Native American artifacts like this beautiful drum. I am part Native American on my father’s side, and I lecture about some of the old lifestyles of local southern California tribes. I have accumulated a number of musical instruments and encourage the kids to play with them. The grandkids are not only part Native American on their dad’s side from my ancestry, but from their maternal grandfather as well. In fact, on their maternal grandfather’s side, they trace back to Jamestown Colony days in the early 1600s to a daughter of Chief Powhatan, a half-sister of Pocohantas. One of the reasons that I do this role play is that I want to connect the grandkids with their interesting and varied cultural history. 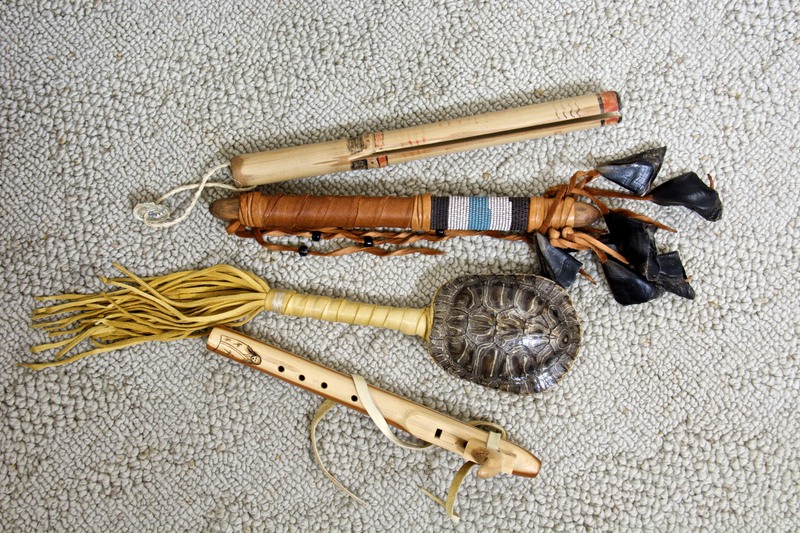 From top to bottom, a clapper stick, a deer hoof rattle, a turtle rattle, and a flute. The deer hoof rattle is the only artifact that I don’t let them play with because it has great cultural significance to the Kumeyaay of San Diego. It is used only for funerals. I have used mine at the funeral of my mother, and of my oldest son Bob, both of whom passed away ten years ago this year. I am probably forgetting some of the fun things that we do while playing Covered Wagon Days, and I didn’t get out the many toy horses for a photo, but I think you get the idea. Do you enjoy this post? Do you pass on your family history to your descendants or relatives? This entry was posted in Uncategorized and tagged cast iron cookware, china head dolls, covered wagon, family history, homemade bread, Native American musical instruments, pioneer days, sourdough. Bookmark the permalink. What a wonderful way to share your family history!! I have always been fascinated with the journey west and truly enjoyed reading about your families voyage. So interesting! Thanks, Tera. Sorry it took me so long to get back to you. I had temporarily abandoned my blog. I tried really hard to make my family stories come alive for my grandkids. Lou, thank for sharing this post. I felt like I was experiencing it along with your grandkids. We read the Little House on the Prairie books with our girls and loved them. I was never as inventive as you bringing history to life but look forward to doing so if I am lucky to have grandkids in the future. You are an inspiration. Tony, so sorry to have taken so long to get back to you. I abandoned my blog for a while. 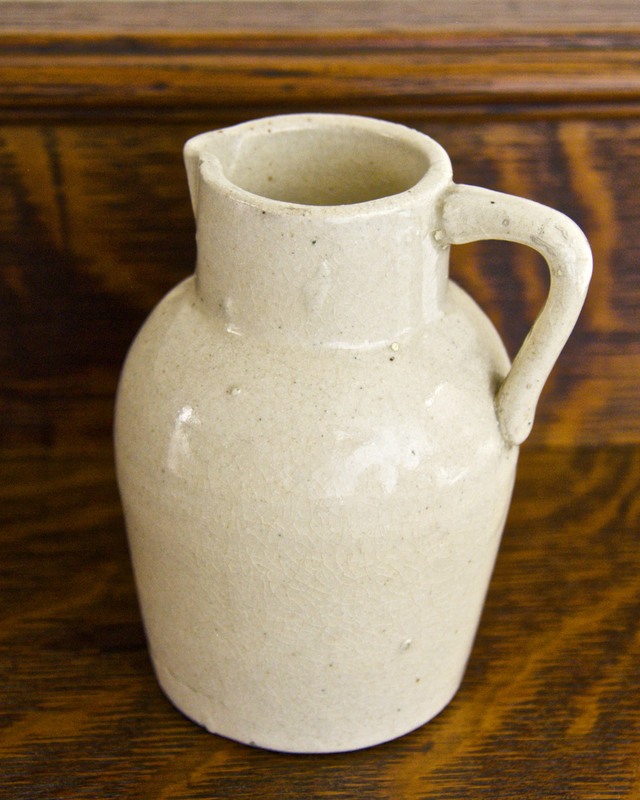 I suspect that the jug that you have came from Aunt Zorie’s farm, or from the auction that Dad ran. I too enjoyed this post very much, thank you for sharing and I agree with Linda, you are so inventive. Your grandchildren are very fortunate.